Working the catwalk in gorgeous high heels that are designed by world renown designers is something every model dreams about. On the flip side of that are those moments that every model has nightmares about…you know taking a dive on the catwalk in front of the entire fashion world! No wonder some of these girls don’t make it down the runway as you’ll see here in the pics below. 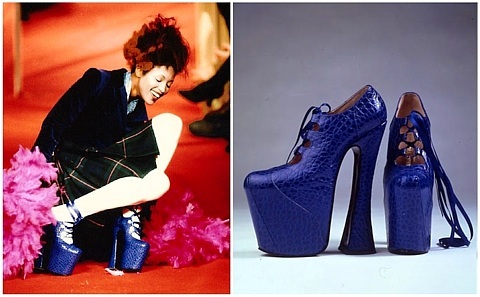 With crazy platforms (Naomi Campbell in 1993 wearing 10-inch moc croc platforms) & high heels that a normal woman would never attempt to pull off, accidents are bound to happen. This of course is unfortunate at the time it happens but afterward is great for laughs because here is the epitome of beauty and fashion and them wham…they hit the floor! Not funny but funny provided they aren’t seriously injured!